Dili, Timor-Leste, 10 September 2018. Timor-Leste became the 27th Signatory to the CMS Dugong MOU. The Secretary General for the Environment, H.E. 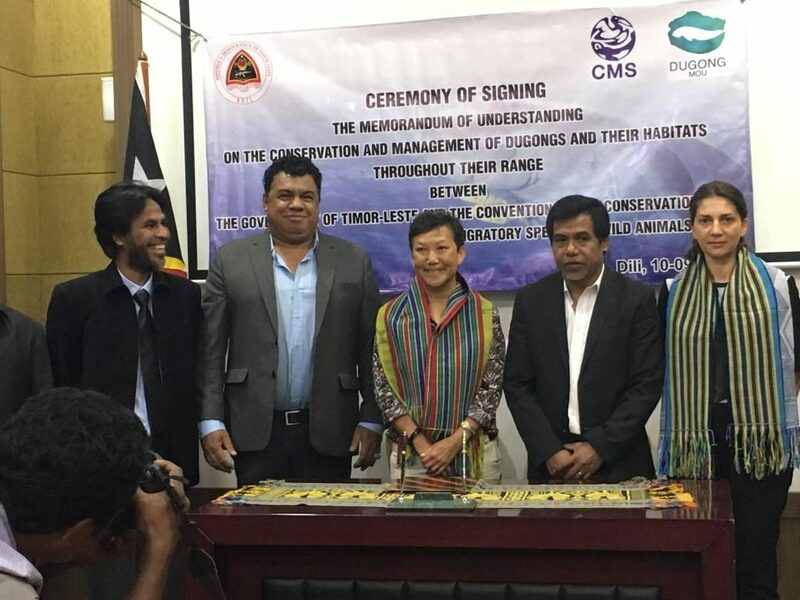 Demetrio do Amaral de Carvalho (pictured below, second from right) signed the MOU earlier today at a ceremony in Dili, and in doing so committed his government to the long-term protection of dugongs and their seagrass habitats through specific, targeted and internationally recognized conservation programmes and activities. From left to right: H.E. Merício Juvenal dos Reis ‘Akara (Secretary of state for Social Communication), H.E. Joaquim José Gusmão dos Reis Martins (Ministry of Agriculture and Fisheries), Dr Donna Kwan (CMS Dugong MOU Secretariat), H.E. Demetrio do Amaral de Carvalho (Secretary General for the Environment), and Ms. Maya Bankova (Project Coordinator for the Dugong and Seagrass Conservation Project). This commitment is the result of the efforts of our project Partners in Timor-Leste’s government, the Ministry of Commerce, Industry and Environment – National Directorate for Biodiversity Protection and Restoration (MCIE–NDBPR) who manage projects TL4 and TL5 here. The dugong and seagrass conservation activities undertaken by Timor-Leste under the GEF Project represent a significant contribution to international dugong and seagrass conservation efforts. Since the project’s inception, 12 communities in Timor-Leste are actively conserving their seagrasses through the creation of Marine Protected Areas (MPA) and another community has identified an area to be protected as a dugong specific MPA. The Dugong MOU came into force on 31 October 2007. The Dugong MOU Secretariat is hosted by Environment Agency – Abu Dhabi on behalf of the Government of the UAE.